Komatsu America—Laser Group, Novi, MI, has introduced its fastest performing system yet with the TLH Series 5-axis, three dimensional Komatsu Fiber Laser processing machine. The TLH Series, of which there are three models, provides cutting speeds to 1,181 in/min (30,000mm/min)and features fiber optic beam delivery with 2 and 3 kW power options. The series is ideal for hot stamping operations and has shown itself to be more accurate than other operations such as robotic laser systems. Further, the series is ideal for any production application that requires high speed cutting of thin gage mild steel, aluminum or stainless steelÉworking best with materials less than 3/8″ thick. These highly rigid machines allow operator access from the opening of one side of the machine for optimal accessibility. The feature provides dramatically superior operability and workability. The series provides X, Y and Z axis travel up to 177 in. (4500mm), 45 in. (1150mm) and 20 in. (500mm) respectively with positioning and cutting accuracy 0.0015″/19.68″ (0.04mm/500mm) Combined with its controllable optical head angles of +720 degrees on the C axis and rotation of +/-135 degrees, on the A axis, the TLH can operate in virtually all cutting applications. The series can be modified with two integral pallet changers or a large indexing table (up to 120 in.) for increased flexibility and production. The system uses a Windows® operating environment, non-contact gap sensor technology, controllable optical head angles, and operator friendly joystick and hand-held pendant—along with a teach mode that all help to make complex cutting simple. The TLH Series was developed to provide, through simple programming and operation of integrated motion and laser systems, high-productivity performance in cutting complex parts, to generate intricate beam paths and to adapt laser parameters to various cutting requirements. The TLH also provides precision cutting, established first on its cantilever-style construction and solid base that are the foundation of its operating accuracies. The construction features are matched with AC servo motor drives, ball screw feeds and linear ball guide mechanisms that provide movement tolerances of +0.0019 in. per 19.6 in. of travel distance (+0.05mm per 500mm). To assure consistent beam penetration despite contours and form irregularities, the TLH’s non-contact sensor provides rapid response to changes in the gap between cutting needle and material to maintain the beam’s optimum focus. The TLH Series programs can be prepared either by using the teaching playback system or by using NC data made with an optional automatic programming system and corrected by the teaching playback system if necessary. The teaching mode allows for settings for on/off laser beam, pulse rate, laser power, cutting speed and other parameters. In addition, the control incorporates memory storage for multiple part programs and includes integral subroutines such as linear, circular and spline interpolations, copying and mirror shaping, pattern downloading, circular cutting and corner rounding from center point definition, scheduling parts and operations for unattended production. Machines includes the TLM Series 3-dimensional, 5 axis. 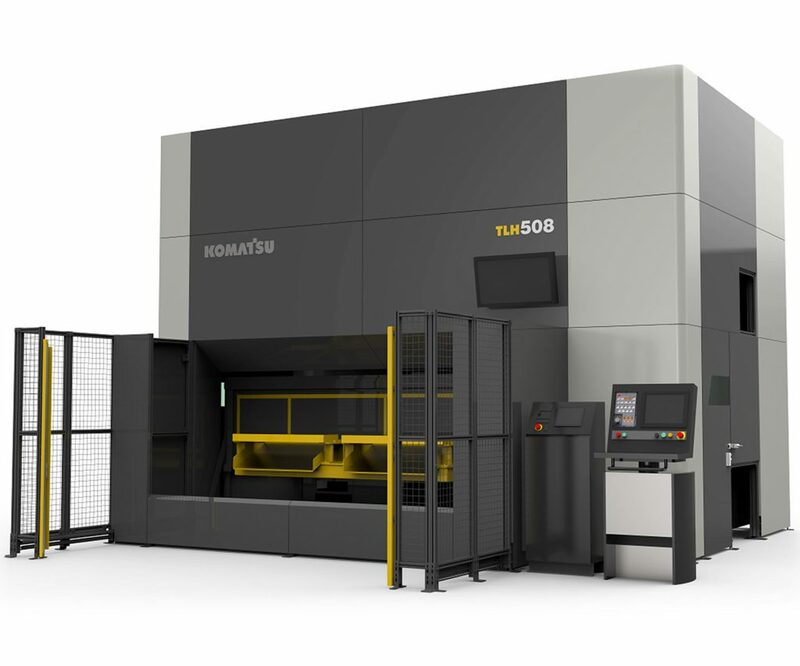 The TLH Series of Komatsu Fiber Laser 5-axis, 3-dimensional laser cutting systems from NTC America—Laser Group, (shown with dual pallet change) is an ultra high speed and versatile performer ideal for hot stamping and a variety of process applications.